RAPID by ACOM Health (a subsidiary of ACOM) is one of the most trusted chiropractic EHR and practice management software solutions on the market. 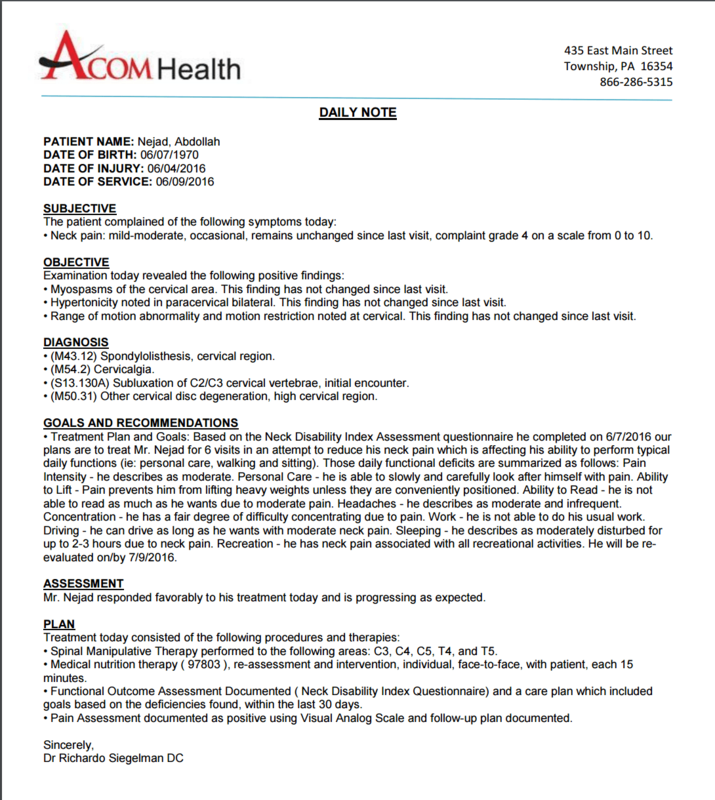 Backed by ACOM Solutions, a technology company with a 30+ year track record of developing high quality software, ACOM Health’s certified RAPID software for chiropractors has a substantial tech and support team working to constantly improve the product and stay on top of regulatory changes. Most notably, the team has already added all of the functionality needed to satisfy Medicare's MACRA/MIPS requirements, which took effect in early 2017. Is RAPID the right software for you? Developed specifically for chiropractic practices, RAPID (by ACOM Health) provides all of the necessary features to run your practice, including a patient kiosk to simplify patient registration and check-ins, as well as an optional end-to-end billing and collection service. RAPID can be installed locally or on the cloud, but the cloud installation is most recommended. With the cloud option, you won’t need to worry about backing up your data, and you can rest assured that your data is stored in a HIPAA-compliant fashion. Can be installed locally, or on the cloud. Feature-rich, and fully integrated software. 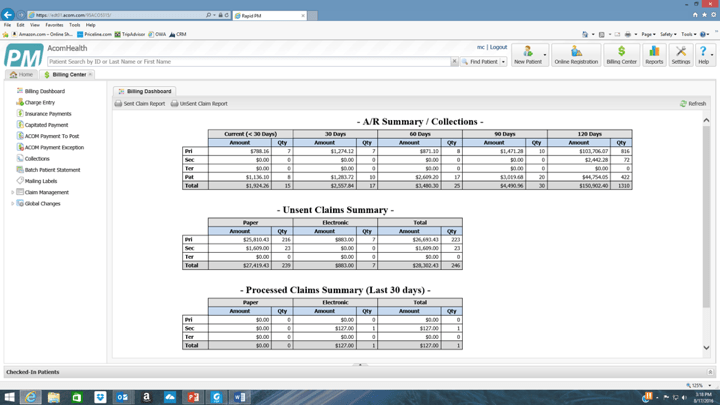 Strong reporting capabilities, including custom reports. ACOM has a track record of delivering high-quality software for over 30 years. Local installation is only supported by Windows OS. Incremental fees for optional modules, such as Appointment Reminders. Marketed only towards chiropractors in North America. $199 - $299/month depending on which package you choose. Month to month subscription pricing, so no contract. RAPID by ACOM Health has grown to become one of the most popular chiropractic software solutions on the market. In 2011, when the Meaningful Use requirement began, RAPID was one of the first solutions to help chiropractors satisfy the Meaningful Use requirement. As a result, many chiropractors were drawn to RAPID’s EHR system which, at the time, was a separate module from its practice management solution. Since then, RAPID has combined these modules into a fully integrated practice management and EHR solution. Below, we discuss the key features of RAPID, and how they can benefit your practice. The touchscreen kiosk eliminates the need for clipboards and paperwork, giving your practice a more professional look and feel. This is one of the most important ways that RAPID saves time for both patients and chiropractors. Patients can check in through the touchscreen, and update their most recent medical complaints based on their previous visits. The touchscreen will then walk patients through each complaint, and have them update the status of each complaint. This information gets directly transferred to the chiropractor’s notes. New patients can register either through the touchscreen kiosk, or online, which greatly simplifies new patient registration. Any information entered through the kiosk or online will automatically get stored in the patient dashboard. 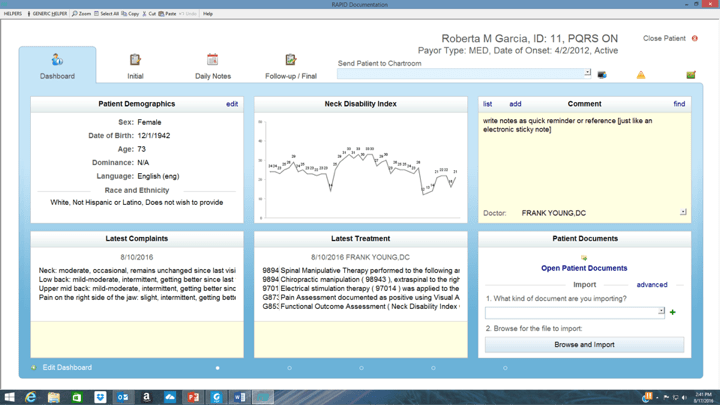 The patient dashboard organizes the patient’s information into one central location. You can organize your dashboard into several screens, each consisting of up to 6 panels. The dashboard is also customizable, which makes it easy to select what information goes into each panel. You can also store alerts for each patient so that whenever you open the patient’s dashboard, the alerts will pop up and remind you about important information about the patient. The dashboard stores information about the patient’s visit history, so you can monitor their progress across visits, which is important for outcomes assessment and for proving medical necessity. With RAPID, chiropractors can create daily notes in under a minute just by clicking or tapping the touchscreen. 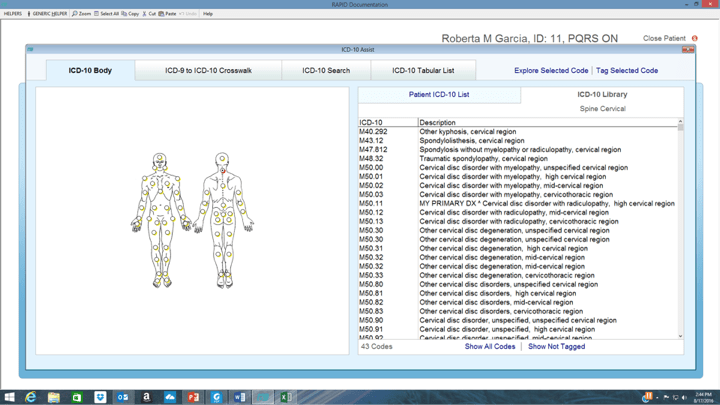 The software has a library of all of the ICD-10 codes, and maintains a shortlist of the relevant codes for chiropractors. If you tap on any particular section of the body diagram, the relevant ICD-10 codes for that area of the body will pop up. After the patient has updated their subjective complaints through the touchscreen kiosk, the information immediately gets transferred to the doctor’s notes. The software will automatically populate the daily note with all of the information from the patient’s previous visit, which means that to complete the note, the doctor only has to update the progress for the objective findings of each complaint. The software also outputs the full report, which you can review and modify as needed. 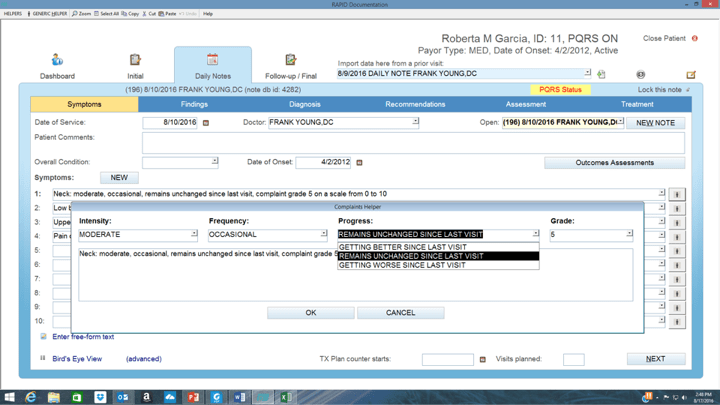 A unique feature of RAPID is that the software will create an alert if a note is missing required documentation, and will make sure that the note is PQRS-compliant and has all of the necessary G-codes. Since the software is fully integrated, the diagnosis & CPT codes can be sent directly to the billing module without any double-data entry from a staff member. The notes drive the billing, which protect your practice from post-payment audit threat. 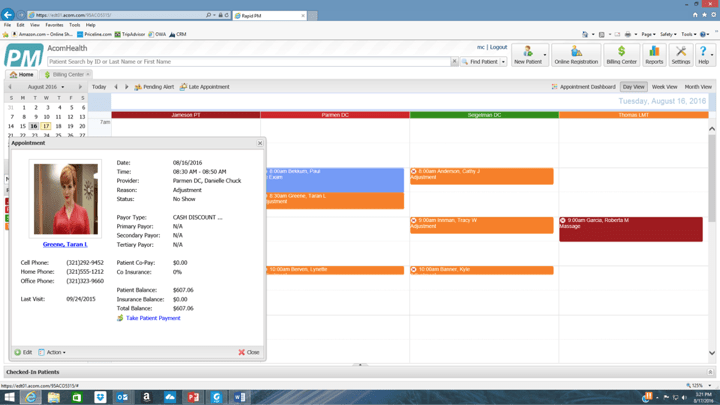 RAPID makes scheduling easy, with its color-coded scheduler that enables you to specify the provider each patient will be seeing, and the reason for the visit (which comes from a customizable dropdown menu). When the patient arrives at the office, the front desk staff can easily check in the patient from the scheduler, just by clicking on the appointment. Alternatively, patients can check themselves in using the touchscreen kiosk, which is a nice feature that frees up time for your front desk staff. When checking themselves in, patients can fill out their subjective complaints, and this information will be transferred directly to the doctor’s notes. Patients can be scheduled for single appointments and treatment plan visits. The software also enables you to send automated appointment reminders, which can be a helpful way to reduce no-shows. You can also reach out to patients for marketing purposes to promote services/ products, and ask them for referrals in an effort to increase your patient base. RAPID also has an Email blast, which can send emails out to all your patients, and is a great tool to alert patients if you will be closed, or if you wish to promote services or products to everyone at one time. If your practice doesn’t have experienced billers on staff to handle non-cash claims and to manage your rejected insurance claims, you may want to consider using ACOM’s end-to-end billing and collection service. Roughly 20% of RAPID’s user base takes advantage of this service. The service comes at an additional cost, but can be a worthwhile investment given the additional revenue that it will bring in, and the corresponding reduction in write-offs. Outsourcing your billing can also save your staff turnover, and the associated stress and cash-flow interruptions. ACOM claims that by using their end-to-end billing service, you can attain initial claim submission payment rates of over 98%. If your practice prefers to manage its own billing, RAPID’s billing module is still able to streamline the process and make sure that claims get sent out promptly with the proper codes attached. After a patient finishes their session, as soon as the doctor selects the treatment and billing code in the notes, the information will flow directly to the billing module. This enables the patient to check out immediately -- the doctor doesn’t even need to finish their notes before allowing the patient to check out, which helps both the front desk and billers move more quickly. Since RAPID is a fully integrated software solution, documentation gets sent directly to the billing module, making it easy to send out claims to insurance. One nice feature is that the collections module has hyperlinks to each claim, so in the event that there are any issues with a claim, the biller can resolve the issues directly from the billing dashboard. As soon as claims are paid by the insurance company, the payments will get posted into the ledger. The software includes a suite of standardized reports, which help you track your finances and identify areas of improvement for your practice. For example, you can identify the most profitable sources of referrals, or the amount of insurance claims sent to specific insurance providers vs the amount that gets reimbursed. The most commonly requested reports are all part of the suite of standardized reports. However the software also allows users to create custom reports. As long as the data is tracked by the software, you can use it to create your own custom report. If you're looking for a complete chiropractic practice management solution that can be hosted either locally or on the cloud, then ACOM is one of the top solutions on the market to consider. The software offers benefits to everyone involved in your practice, and is developed by a trusted technology company with a track record of delivering high-quality software. We’ve found the software UI to be very intuitive, so it should be easy for less tech-savvy users to learn quickly. However, if you’re looking for a solution that will run locally on a Mac, RAPID would not be appropriate for you, since the software only runs on Windows when installed locally. However, many of ACOM Health's clients prefer using Windows Tablet PCs with a stylus, so they can just point-and-click to generate their notes in real time, and move from room-to-room while providing patient care. We also like that if your practice doesn’t have an experienced biller on staff, you have the option to outsource end-to-end billing and collections to ACOM Health’s team of experienced billers. With exceptional software and customer support, we highly recommend ACOM Health’s RAPID Complete chiropractic solution. To learn more about ACOM Health, you can visit their site here. You can also read our interview with Dr. Jennifer Finn, owner of Finn Chiropractic, to learn more about why she chose to use RAPID, and how it's helped her practice by streamlining her documentation process, and by helping her with the Meaningful Use attestation process.